As part of a week of giveaways of books in our Bellyitch Blog Library, Bellyitch Book Week, here is the second book up for grabs, Motherhood Rescheduled! Read the review we did earlier on the book and enter below! Winner selected After contest ends this Saturday at midnight! Open Internationally! In 2002, author Sylvia Ann Hewlett wrote a book professional women and the quest for children which scared many career women in their 30s silly about the limited time they truly had to find a suitable mate and get pregnant. I joined my generation in a collective gasp. “Now?” I whined to myself. I had just finished graduate school and was trying to launch my career as a freelance journalist Plus, I still had to break up[with current boyfriend who didn’t want to settle down], grieve, find a new apartment, move out, lose ten pounds, acquire new relationship skills, and try to meet someone else. Then I had to get engaged, marry, and make a baby. That left very little contingency for rebounds, bad judgment, and trouble becoming pregnant. I thoroughly enjoyed the very “real” and relatable passages like this one above when reading my complimentary hardback review copy (retail value $25.00). In Motherhood Rescheduled , Richards uses a narrative format to take readers into the lives and minds of 6 women, including herself, as they each contemplated, researched and then went about the steps to freeze their eggs in hopes of having a baby beyond their prime time. Each women had different life stories, complications and personal pathways to their decision. There is variety to their individual rich experiences, and so much so that many women in their 30s and maybe 40s may be able to relate to at least one. And to mix it up and provide some medical professional perspective, one chapter is dedicated to a doctor who specializes in helping women freeze their eggs and deliver babies from their frozen eggs. The book reads like a novel and engages readers because rather than a simple instructive step-by-step guide, it is more of a inside look at segments of each subject’s life. You are invited into the conversation and through that reading journey, you, as a reader are better able to understand what motivated each woman’s decisions. But it is also educational as there is generous inclusion of stats, data and resources within the passages. The book is well written with fluid prose and dialogue dispersed throughout making it an easy and very quick read. It was instructive even for those who may not have had to resort to the decision Richards had to, but who seek to be educated about the various options that women have for having a kid, and the various calculations each may have to make. I’d highly recommend it for anyone contemplating freezing their eggs or just curious about the process. 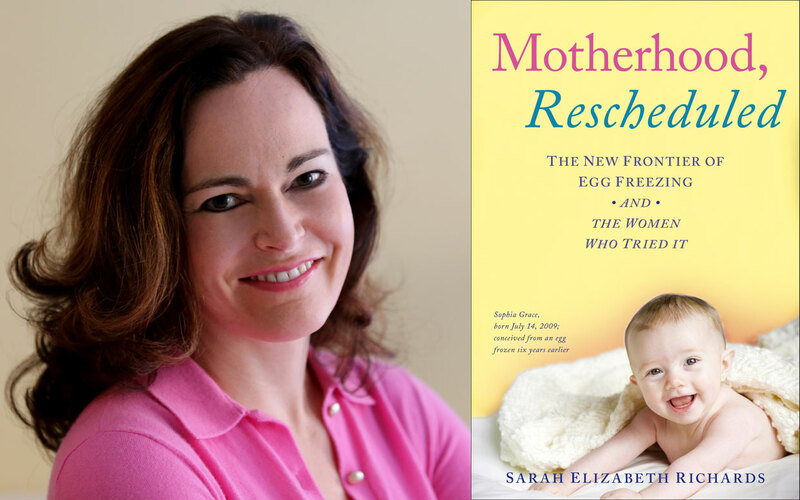 The cover art to the book features Richards’ daughter who she successfully gave birth to 6 years after freezing her eggs at age 39. The book, published by Simon and Schuster, is available in stores and at Amazon.com.